My most favorite part of working as a school librarian is the interaction with the students. Our students are young people from approximately 11 to 18 years old and most of them are enthusiastic and motivated to learn and to discover life. Per-sonally, I cherish the conversations with them about their life, their interests, struggles and, of course, about more library-themed questions like ‘what to read or what not to read,’ for example. 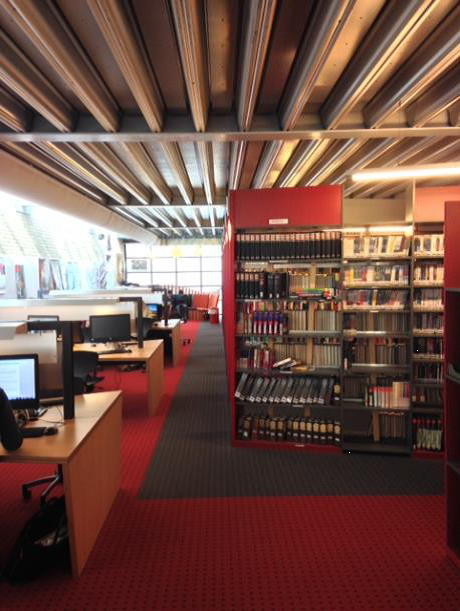 In our library we want our students to feel welcome and my colleagues and I created an inviting and inspirational environment where they can find information, or use our study facilities. As a child, I loved reading and therefore I was a loyal visitor of our local public library. 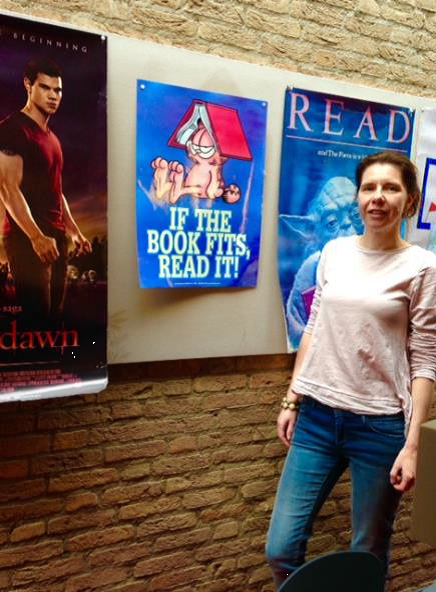 Although being a dedicated reader - at least when I was in my childhood – made it easier for me to work in an environment that involves books, it is not the main reason for my choice to work as a school librarian. As I grew up, I discovered that I wanted to work with both people and with information. I searched for a job where I could be the connection between (young) people and information re-sources. And that is exactly what my current job is about: connecting people and information. Not only inside our school but also in the regional and national network of Dutch school librarians. Our national platform for school librarians is called the BMO. During the recent IASL Conference at Maastricht, June 2015, we presented ourselves to all conference visitors. I par-ticipated in our regional meeting group of school librarians because I believe it is important to network with other school librarians. We can learn from each other, support one another, and work together in projects concerning all school librarians. During my ‘career’ as a school librarian, I was lucky to attend several international conferences of school librarians and per-sonally I get lots of inspiration out of these meetings. It does not matter in which part of the world we live and work, as school librarians we all want the best for our students be-cause each child deserves it! Together with my library colleagues (one librarian, one teacher, and one volunteer) I manage our school library which is centrally located in the school building. We serve 1100 stu-dents and 80 teachers. Although our library can be used for many purposes, our main goals can be described as ‘offering access to information resources’ and ‘offering study facili-ties.’ We have a physical collection including books, maga-zines, and DVDs. We have books written in Dutch, English, French, and German in different levels, and our Dutch and Eng-lish fiction sections are the most popular sections of our li-brary. Fictional reading is part of the curriculum so therefore our library provides an attractive collection of fiction books in different languages. We also participate in national reading promotion activities such as Jonge Jury (for 12-15 yr.) and Inktaap (15-18 yr). Therefore we cooperate intensively with the teaching staff. Since our school is a Dalton school, every day the students have at least one, so called, ‘Daltonhour’ (50 min.) where they are free to decide where they want to study and on which subject they want to work. They can choose to work in a class-room under supervision of a teacher, for example, or they can choose to work in the school library. We want our students to learn to plan their activities so each student has to make a ‘reservation’ in an online scheduling program. And regard-ing the school library it is really necessary to make a reserva-tion on time because the library is a popular space amongst our students. During the Daltonhour we maintain a quiet at-mosphere in the library because our students asked for a space, in our school, where they could study in silence. During the rest of the day we are less strict in maintaining low volume levels because there is also a need for a place where students can work together, complete projects, etc. Our school has many projects imbedded in the curriculum because we want our students to be skilled in working in a team instead of doing things all alone. That makes it not only a vivid and pleasant environment to work in but it also keeps us as school librarians challenged to find new ways in keeping up with our students’ information needs. 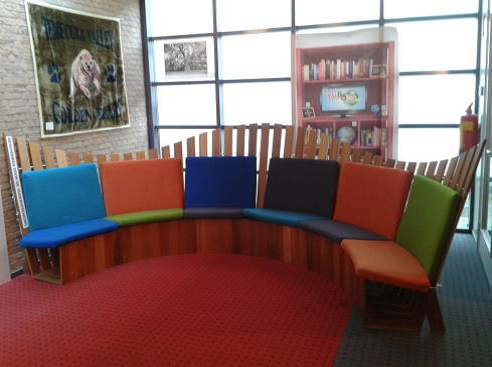 One of the favorite spots in our library, is the ‘leesbank’ especially designed for our library. Students really like to sit (or lay) here and read or have a chat with their friends. Another special spot is the movie box. This is a small room where students can watch DVDs for educational purposes, for example movies based on a book. Our library is designed with two windows that overlook the hallway and we use them as library displays. These are out-standing spots to highlight special collection items or to pro-mote new library purchases. In this photo you can see our display concerning ‘Le petit prince’. they do. I believe we must connect with those who need our support so that every child around the world has access to information resources and can rely on a dedicated librarian. If someone would like to receive more information about our library, please feel free to contact me. I would like to get in touch with school librarians from other countries so we can build a worldwide network of dedicated librarians. like to spend some time on things as: running/jogging, horse riding, crafting (I am a dedicated Pinterest-user), working in our garden, and learning Italian. During the summer I love to go camping with my family. I love rollercoasters, such as the Hulk in Orlando and I also love huge waterslides, like the Summit Plummit in Orlando.